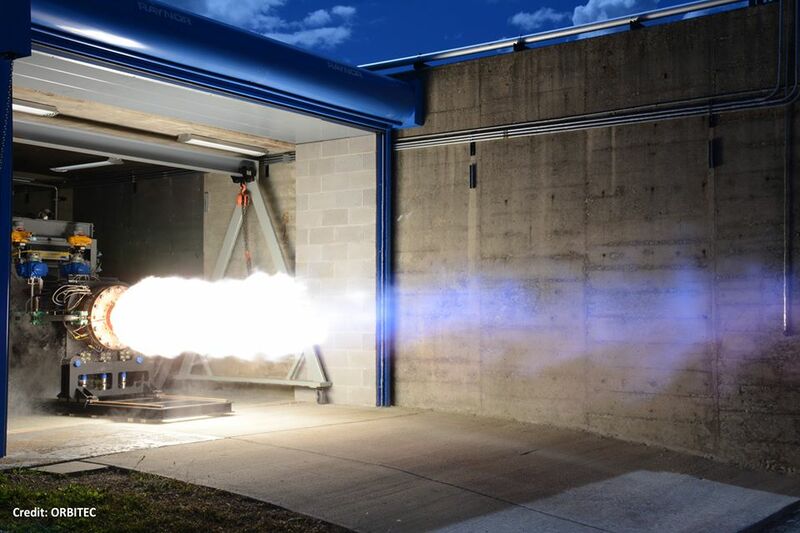 November 10, 2015 – Sierra Nevada Corporation’s (SNC) wholly-owned subsidiary Orbital Technologies Corporation (ORBITEC) recently completed successful testing and demonstration of three different propellant combinations for its existing 30,000-pound thrust vortex rocket engine. Completing this advancement in less than a year, ORBITEC is rapidly progressing its offering of engines for orbital maneuvering, upper-stage engines that ignite at high altitude, and small-to-medium-scale air and ground launch stage engines. These tests demonstrate the ability to transition use of different propellant combinations in the same core rocket engine design with slight changes to accommodate a specific combination of fuel and oxidizer, including propane and kerosene fuels with nitrous oxide (laughing gas) and liquid oxygen oxidizers. This latest development offers customers a suite of engines scalable to higher thrust levels and customer-selected fuel combinations from a single core rocket engine design. ORBITEC’s patented vortex rocket engines utilize a unique swirling propellant flow to naturally cool the engine walls, allowing for the development and manufacture of simpler, low-cost, light-weight and more robust rocket engine systems. ORBITEC, with support from SNC, is investing in all aspects of the rocket engines including valves, turbomachinery and other engine components. Future work on this ORBITEC program will include developing vortex engines to produce 65,000 pounds of thrust, combusting liquid oxygen and hydrogen, and liquid oxygen and methane, and to produce 75,000 pounds of thrust using liquid oxygen and kerosene, another step toward manufacturing larger U.S. engines that break current paradigms in low-cost access to space.